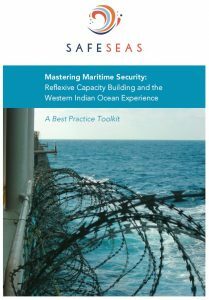 SafeSeas is pleased to announce the publication of the Best Practice Toolkit entitled Mastering Maritime Security: Reflexive Capacity Building and the western Indian Ocean Experience. The report presents the core results of the SafeSeas project drawing on 16 months of research and work with a wide range of partners from the Western Indian Ocean region. The report consolidates the experience from that region and identifies best practices to organise maritime security more efficiently and devise ways in which it can be effectively supported by donors. It provides guidelines for mastering maritime security. Mastering maritime security requires reflexive capacity building. What reflexivity means in practice is demonstrated in this report by drawing on the experience of the Western Indian Ocean region. The report is an important toolkit for all practitioners involved in maritime security. It also provides an essential guide for the planning, programming and implementation of capacity building for maritime security.